in water. Economical and safe, the Sanitron® Ultraviolet Purifier offers rapid water treatment without the use of heat or dangerous chemicals - often for the lowest cost available by any means. 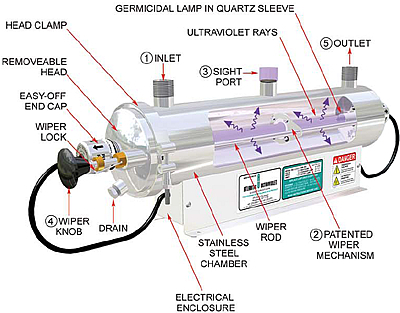 Sanitron® ultraviolet water purifiers produce 3 to 416 gallons per minute of purified water. and passivated stainless steel for an attractive finish and dependable service. operation. No disassembly required. Complies with U.S. Public Health Guidelines. No special tools or fixtures required. Lock wiper mechanism in retracted position.